Twitter is a popular microblogging website where people express themselves in 140 characters. On Twitter, we can follow any twitter person to get his tweet. On Twitter, popularity of a person depends on the number of followers he has. So, everyone on Twitter want to get more followers. If you are following one of your friends, it is obvious that you expect that he will also follow you back. But what if you want to know all the people whom you follow but they does not follow you back? There is a nice too called NotFollow.me, that helps in this case. 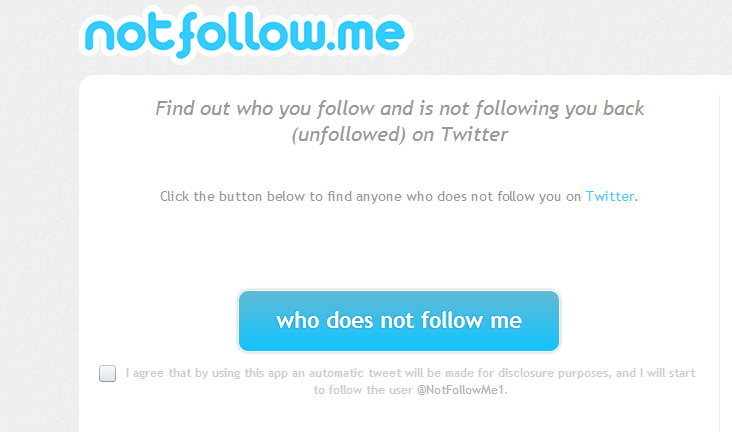 NotFollow.me is a web app that lets Twitter users check those person who are in following list but not in followers list. There is a hidden thing about this tool which people generally ignored. When you use this tool, you have yo allow its app to access your Twitter profile. It use your profile to send a promotional tweet and follows NotFollow.me on Twitter from your profile. If you still want to use this tool, then no problem. For using this tool, just open the NotFollow.me website and you will see a big button “Who Does Not Follow Me” with a Terms and conditions check box. Select the check box and then click on the button. Allow its Twitter app to access your profile, and it will generate the list of persons who are in your following list but not in your follower. With this tool, you can check those friends who are not meeting your expectations on Twitter. Use this tool and share your experience with us via comments.